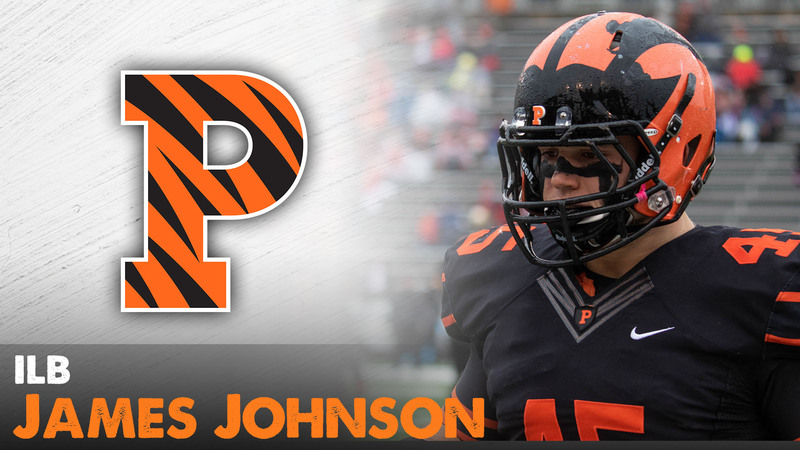 Another year, another Johnson in the middle for Princeton. Brother James follows two-time first team All-Ivy Thomas; the genealogy as strong as the fraternity and the culture perhaps most powerful of all in this family of ‘backers who have each others’ backs. Unabashedly they are dedicated to outperforming the previous brother, even while genuflecting to the next. How competitive are these guys? Paul Sr. answers with a story that is not about football. “They all have learned how to play guitar without a music teacher,” says Dad. “They do it because there is a family fishing trip every summer to Ontario which is a bonding experience with 27 cousins–a crazy number 22 of them being boys. “At night they get around the campfire, play guitars and sing. They all have learned the instrument because they don’t want to be the guy who doesn’t know how to play. Voice might be the only category in which there is a winner by default in this “pack of wolves that we have raised” as Paul Sr. calls them. He is Chief Commercial Officer at Braeburn, a pharmaceutical company with the noblest of missions to attack opioid addiction. Regina is a personal injury attorney. The oldest of four boys, Paul Jr., played nose tackle at Amherst, the first to follow in the athletic footsteps of Paul Sr., who walked on as a defensive lineman at Holy Cross, and Mom, who ran track there. The family tree is as stout as any in the Moorestown, NJ backyard that survived four boys during backyard touch—well, it was touch sort of–football games. Paul Sr. and Regina never lost a (hard-earned) night’s sleep worrying about these kids’ heads being on straight, just like Bob Surace makes it through the night with no concern for replacing Thomas and Mark Fossati, two All-Ivy middle backers. With all the blowouts in 2018, James received almost as many snaps as a sophomore backup as did Thomas as the starter. The same applied for John Orr, who proved much, much more than just a placeholder in 2017, when Fossati was lost for the season in the third game. Spring practice, being held through April 13, is about finding backups as good as were James Johnson and Orr during a 2018 season that not only was perfect in record, but incredibly close to perfect in execution. As one strong recruiting class follows another, so does the next roster of leaders, educated by the last, just like the Johnsons. “He was very, very vocal and got a lot of the guys to follow him. He set a standard, something I will try to live by. Like (John) Lovett, Fossati, (Kurt) Holuba, Thomas was competitive in everything–weight room, meetings, practices and games. With so many examples set, it becomes learned behavior, not as difficult to emulate. Not even 10-0 is an impossible act to follow, according to James. “It’s going to be hard, but I love the challenge,” he said. “We are always hearing it in our ears. Always. Nobody turns it off. Perfect would hardly describe the deportment of four husky, rambunctious, willful, and delightfully outgoing Johnsons, sweet little angels only in the eyes of Surace and his staff when the kids were running around at prospect camps. “The competitive traits attracted us just as much as their talent,” says the coach. Boundless energy is what you want on the football field, not so much in the living room. Oops, a vase or two met a violent end as the kids grew up. “We had to learn how to spackle so we could fix the damage in the walls before Mom and Dad got home,” laughed James. It never was naughty, just consequential of boys being boys times four. “I wouldn’t call it mischievous, but chaotic,” says Regina. “They are big, loud and energetic and they thrive off each other’s energy. Says Paul: “You know they are brothers when somebody else goes after one of them. They are immensely loyal to each other and extremely supportive. They are always competitive when everybody is healthy and pushing it. But you see how much they care about each other when one is having some problems or is hurt. The majority of the time it does. Not as much the morning an annoyed Paul backhanded Thomas, breaking his nose, sending him to the emergency room before 8 am, not the way you want to start the day. For penance, Paul spent the weekend the worst place there ever was–oh no, not indoors! –and the boys attended each other’s basketball games and James’ school play. No word forthcoming as to the best actor in the family. But all were in the front row for the performance, no matter where they preferred to be. “That’s what the Johnson bothers do to (discipline) their kids,” says Paul Sr. They also make sure they get the best possible educations, a parochial one in the Johnsons’ view worth a 35-minute drive every morning across the Betsy Ross Bridge to St. Joe’s Prep in North Philadelphia as a prelude to Princeton. ”The schools in Moorestown are excellent but we made a commitment to a Catholic education,” says Regina. “I wouldn’t say they chose St. Joe’s for the football program, as good as it became (two state titles for each of the boys, one of them shared, under coach Gabe Infante). “It was just so awesome for them to be exposed to a place with such a rich cultural diversity. Kids come there from all over. “Thomas connected so well with his (Princeton) recruiting coaches that I would say he knew (early) Princeton was his first choice. James wanted to make sure he was making the decision for himself rather than following his brother. We explored other opportunities and in the end it was his decision that was the best place for him, the cherry on top being he would be able to play with his brother and cousin. Paul Sr. is one of eight boys. Brother Matt, who played nose guard on the 1987 Penn State national championship team, is the father of Princeton’s Sam Johnson, who made a big contribution in double tight end sets in 2018, particularly on the goalline against Dartmouth. Every inch the line pushed back one of the great defensive units in Ivy history turned into one huge yard at a time in a 14-9 victory. If there is anything these Johnsons love more than each other, it’s a challenge. Whoever has the most fun playing football ends in a dead heat.